is your salesmen that take care of us! They are some of the most outstanding representations of customer service I have ever encountered! We were outfitted by a new apparel company, Pepwear. Pepwear did an incredible job of appealing to the kids with designs that were appealing to them while also being very comfortable. I have been involved in USA events since 2010 and this was the best quality gear that we had been issued in my experiences. I absolutely love the people at PepWear. Your design team and sales reps will do anything to ensure that we get what we need. They have gone above and beyond for me this year and I so appreciate the camaraderie and rapport with our school, no matter how small or large the job. Thank you for your honest and friendly service. PepWear is wonderful! They make the process of designing and ordering t-shirts, sweatshirts, and other promotional items so easy. Their art department helps me turn a vague idea into the greatest t-shirt designs. Every time I call, I talk to a friendly, helpful and informed sales person. I continue to be a loyal PepWear customer. After trying several different companies over the past 26 years, they are by far the best company I have found. Their prices are very competitive, high quality products, very creative art department, and order turn-around is very fast! The sales staff is very knowledgeable, courteous and professional. Because of such amazing customer service and high-quality products, I have no problem referring others, even my family, to use PepWear. It is really fun to be rewarded for something that I would do anyway. I wear my jacket all the time and use my iPad for both work and fun. It’s one thing to have good artwork. But that doesn’t mean a thing without great production. PepWear is dedicated to commemorating the achievements and accomplishments of youth, whether in music, sports, or the arts. Through our custom ordered apparel and official event merchandise, we serve our mission of making school memories last forever. We work directly with teachers and organizers all over the country as well as attend more than 600 school and youth events each year. PepWear provides custom apparel for sports teams, high school marching bands, and business organizations. We have highly-trained technicians, a strict quality control process, and state-of-the-art equipment to ensure that even the largest orders meet YOUR high standards for quality and fast delivery. You plan the event, we do the rest. Each year, PepWear attends more than 800 events to celebrate youth achievements through onsite T-Shirt, Plaque and other memorabilia sales. Embroidered apparel is a great way to show off your spirit. This versatile and durable option will last and look good long after the season has ended. We design custom patches to help you promote and recognize your tournament, league or team. Our beautiful, handcrafted wood and metal plaques celebrate the achievements of young people and make great awards. 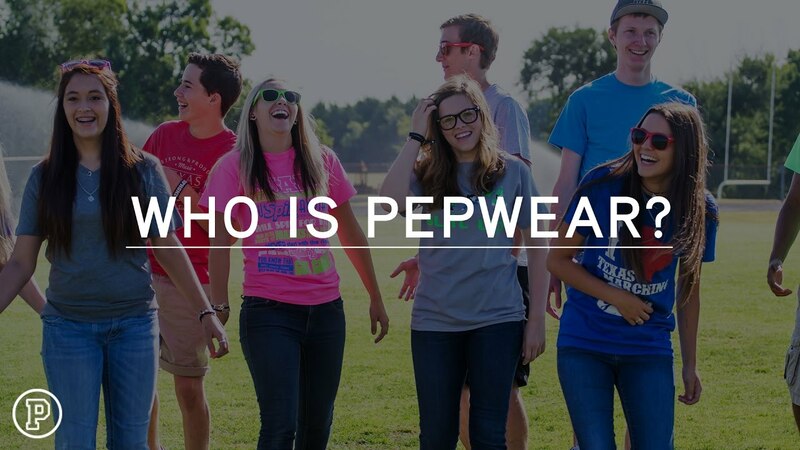 With the PepWear Referral Program, each time you refer a friend to PepWear, your friend gets a $50 discount on their first order, and you receive a $50 credit on a future order! Join the PepWear Ambassador Program by referring a friend using the Referral Program. As a PepWear Ambassador, in addition to receiving a $50 product credit for each new customer you refer, you will now receive great Rewards as you achieve referral milestones.